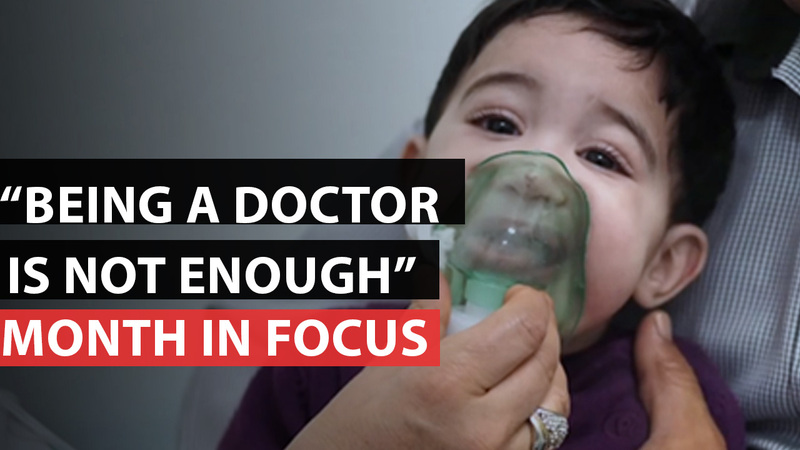 This Month in Focus looks back at Médecins Sans Frontières (MSF) work with the current migration crisis the Mediterranean Sea, the Al Quds hospital that was destroyed in Syria, MSF's 'Fair Shot' campaign and the Ugandan fishing community affected by HIV/Aids. We take a quick look at the MSF supply chain and end with a voice from Libya's struggling health system. Syria - Al Quds hospital destroyed in airstrikes. In 2015, given the European Union’s refusal to offer them legal and safe alternatives, almost one million people seeking to flee to Europe had no other choice than to risk their lives at sea. 4,000 people drowned in 2015. In 2016, in spite of the increasingly coercive measures adopted by the EU, migrants desperate to flee continue to attempt the crossing. On April 27th, the MSF-supported Al Quds hospital in Aleppo was bombed. The hospital had been delivering emergency medical care to people living in this war-torn city since 2012. On April 27th, MSF delivered a petition to Pfizer, one of the two companies manufacturing the pneumonia vaccine. The petition demands a reduction in the price of the vaccine for developing countries. Pneumonia is the leading cause of infant mortality worldwide. Every year it kills close to one million children. In Uganda, combating HIV/AIDS continues to be a major challenge. 1.4 million Ugandans are HIV-positive. MSF has opened an HIV/AIDS programme in Kasese district. In the small fishing village of Katwe, 43% of the population are HIV-positive. MSF has acquired considerable expertise and resources in logistics and the supply chain. This enables MSF to deliver medical assistance and better respond to the needs of victims — whoever and wherever they may be. Whether it be responding to an emergency caused by natural disaster, treating casualties of war, vaccinating hundreds of thousands of people in just a few weeks or setting up a refugee camp in the middle of nowhere, logistics and supply are essential to MSF’s operations. 5 years after the fall of Gaddafi, Libya is divided in two, each with its own government vying for power. In the video above, Khaled Almnfe, deputy head of mission, describes the impact of the conflict on Libya’s health system.